In contrast to many of the textbook apps, Little Apps are not primarily about explaining statistical theory. Rather, they let you introduce theory and methods gradually to illuminate and refine stories about data. StatPREP Little Apps are designed to let students explore specific statistical techniques in the context of data. Each Little App has tabs that show the graphs, an explain tab that helps to explain the concepts, codebook that tells about the dataset and the variables, and R commands that show the R commands that were used in the Little App. To share these with your students, you can click on the picture and copy the web address. The website is also below each picture. If you have used the Little Apps in the past you will now see a redesign of the Little Apps. The purpose and use of the Little Apps haven’t changed, but the layout and some functionality have been improved. 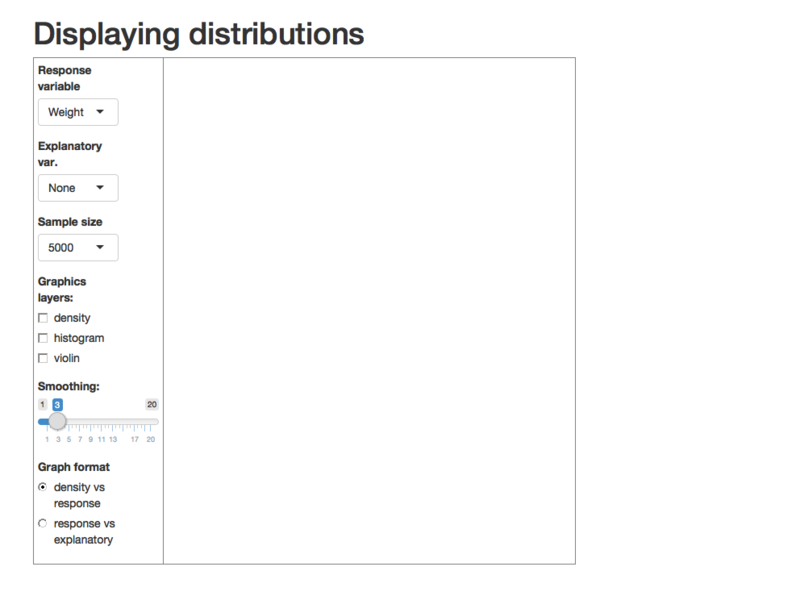 First, you can now choose from different data sources. Once you pick a data source, you can then pick which variables you want to be the response variable, explanatory variable, and covariates if you want them. In each Little App you will see a tab for sample, which lets you take a new sample and pick the size of the sample. Below the graphic you will see a Codebook tab, Statistics, Explain, R commands, and Debug. The Codebook tab has more information on the data set you selected and the variables in the data set. The Statistics tab on some of the little apps shows the calculation values that you are use to seeing. The Explain tab gives a little background and expository material to help you teach the topic. R commands tab gives you the commands to recreate the R commands if you want to teach them to your class (the package mosaic will be needed to compute many of the R commands). The Debug tab is for our purposes and isn’t needed by you or the students. There may be some variation in each of the little app, such as in the t-test Little App there is a slider for adjusting the mean for the null hypothesis in a one sample t-test. Play around with the Little Apps to learn more of what they do. This Little App allows students to play with data by picking different response variable, and explanatory variables. 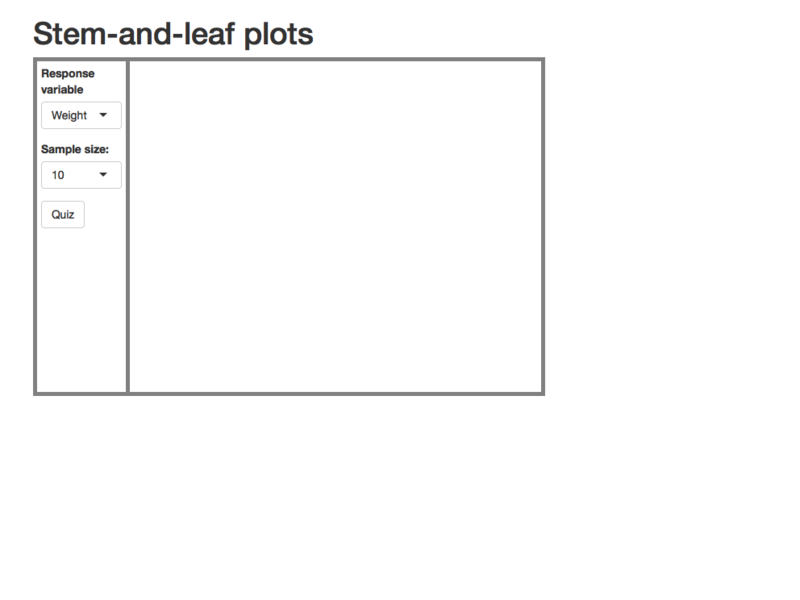 Then they can visually see the data plotted and where the mean, median, range, and standard deviation are. 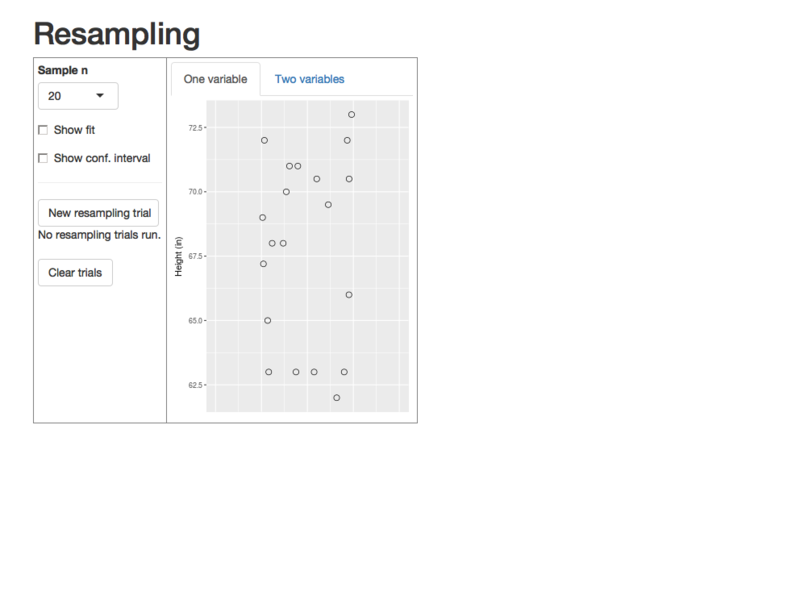 They can also pick new samples and see how samples change the descriptive statistics. The website is found at https://dtkaplan.shinyapps.io/LA_center_spread/. This little app allows you to introduce the concepts of a two-sample t-test. As with the other Little Apps, the students can pick different variables to make hypothesis about and then visually see the confidence intervals, and the t interval that can be calculated. They will also see the p-value associated with the t-test. There are different options that can be played with to help the students understand a two-sample t.
This Little App is similar to the t-test, but deals with proportions instead. There are also different options that can be picked to show the concepts of the proportion test. This Little App hasn’t been redesigned. The website is found at https://dtkaplan.shinyapps.io/LittleApp_proportions/. As before, the students can pick different variables to investigate regression. There are again different options that the students can investigate different aspects of regression. 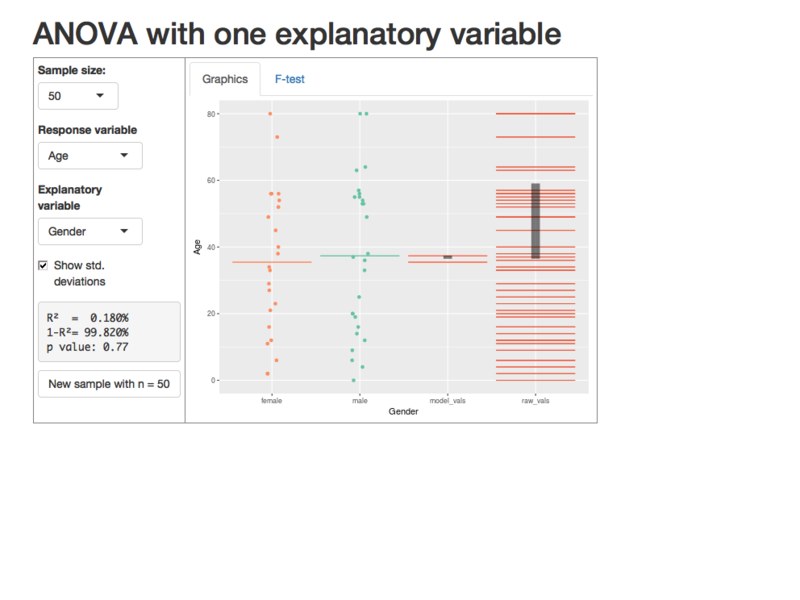 There is also two extra tabs that show the output from R for ANOVA and Regression. The website is found at https://dtkaplan.shinyapps.io/LA_linear_regression/. This is a new Little App. It allows you to visually show students what is happening in the Resampling method that is part of the new methods for doing statistics. Currently, this Little App is still under development, but it can be used in its present form. The website is found at https://dtkaplan.shinyapps.io/LA_bootstrap/. The following Little Apps have not yet been revised, but will be at some point in the near future. Still, these Little Apps can still be used in your classes. Little Apps for some conventional graphics. These apps don’t use the “data graphics/statistical graphics/inference graphics” trichotomy. Instead, they use the varied and inconsistent forms of traditional graphics. Feel free to look at these and see if you wish to incorporate them into your classes. Why density and not count? These are documents describing some of the ways the Little Apps can be used. 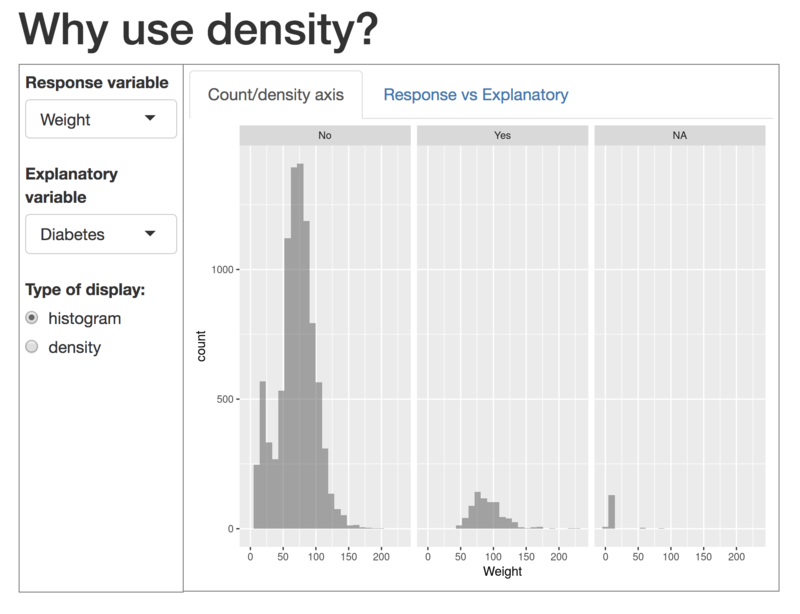 Why density instead of counts? app.